French-country meets new-world flavors in a classically elegant setting. : A Jacksonville mainstay since 1974, Wine Cellar is an oldie but goodie. There are 90 different kinds of wine on display at the entrance (and many more available) allowing you to make your choice before being seated, and about 12 varieties available by the glass. Such a selection is sweetened by the cozy European feel of the restaurant. Appetizers include a portobello mushroom topped with lobster and shrimp, finished with béarnaise sauce, and steak tartare served with capers, red onion, Dijon mustard and crostini. Move on to the dill-encrusted salmon, or chicken breast stuffed with prosciutto, asparagus and mozzarella. Early in the week, stuffed shirts come for power lunches, but on the weekends, the restaurant sports an eclectic clientele. 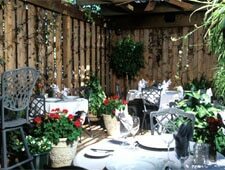 Grab a seat with a view of the patio and you'll feel like you're in a secluded garden instead of downtown.